An advert featuring the Brown Barrett range from a Four Square (Foodstuffs NZ Ltd) Christmas brochure, 1948. Image courtesy Mike Davidson collection. Brown, Barrett and Co was a longstanding foodstuffs company that was present in New Zealand from the late 1860s until the mid- 1950s. Their biggest trade hands down for many decades was tea and coffee; but of course like all the ubiquitous “coffee and spice merchants” of the era – also dealt in a variety of peppers and sundry other taste bud- ticklers that were utilized to dress up dreary (and no doubt often slightly stale) meals. So, how did John McKail Geddes become involved in the industry? Through a very early Gregg’s, as it turns out. He was born in Malta in 1844 to Alexander Geddes and Janet Stevenson, but obtained his education in Scotland. He was by accounts a much liked man – who “bubbled over with good spirits”, and is described as “exhaling a wealth of good nature and camaraderie.” It is nice to have those personal descriptions – as they are far and few between of my subjects in usual circumstances – given that the focus is often on success, notoriety and finance. Observer, August 1908. Courtesy of the National Library of New Zealand. His first foray into the workforce in the U.K. was for a Solicitor; at this time he is known to have been residing in Perth Burgh, Perthshire. In 1862 he decided to emigrate to New Zealand aboard the ship Nelson, where he promptly went to Dunedin and began working at W. Gregg & Co., where he learned how to roast coffee, says his grandson, also named John McKail Geddes (now in his eighties, I’ll refer to him just as John Geddes for this article to avoid confusion). With some years of experience in the industry now under his belt – in 1870 he moved to Auckland and joined the company of Brown, Barrett and Co, which had been founded two years previously. A recreation I have made of the Brown Barrett Baking Powder label, in a photo further down, likely from the 1930s. Hermann Brown (b 1836) was a German who started the business in1868 with his partner of the time in Thames, in the heady days of the first big gold rush there – upon which the company built its early and quick success. It wasn’t the first boom in this “new” country – so smart guys who wanted to make a pound knew how to capitalize on the communities that quickly grew up around any industry explosion, no matter how brief. I found a reference to him being an early, yet short-lived, settler in the Pahi-Paparoa area in the mid 1860s. He claims to have farmed for the first 18 months or so before starting the concern and then making his way “to town” to establish himself there. Little is known (nor have I been able to find anything) of the other half of the original equation, Mr. Barrett, except that he is described in the news as a “co-religionist” – which must mean he, like Brown, was also Jewish. By 1869 the partners had removed to Auckland from Thames and established the Brown Barrett and Co’s Steam Coffee Mills in High Street, Auckland. In a December advert the partners, calling themselves Brown & Barrett, claim to have had 15 years experience in the trade (I don’t know what kind of maths they were using – perhaps it was different then). Actually, they purchased an already established set-up from J. Nimmo & Co. Brown is quoted as recalling “only six or seven buildings in Customs Street, and Quay Street – it was practically non-existent “ – very early days for the town, but never too early for coffee. Barrett departed at some point, most likely in the mid 1880s – leaving Brown and Geddes – of which the latter quickly progressed to partner. Hermann Brown, who seemed to also have been the Imperial German Consul to Auckland for quite a number of years, was still partner in 1888, but had left the country by 1891, returning to Sondershausen, Germany for the rest of his life. Auckland Star, April 1923. Courtesy of the National Library of New Zealand. Records of the 1880s-1890s also show imports such as tobacco, soap, refined sugar, potted fish (sandwich pastes), wax candles, acetic acid (used as a food additive – mostly for the pickling of vegetables and other foods), cocoa, preserved oysters, methylated spirits, confectionery, as well as embroidery machines and patterns. And in the 1900s-1910s – Californian Syrup of Figs and lime juice, preserved fish and ginger, sauce, writing ink, culinary essences, canned apples, milk and fish, mustard, canned and preserved pineapple, pocket vestas, and nuts. Brown Barrett also seemed to have some sort of arrangement up until the mid-late 1890s with Dominion to use beer for something brewed (vinegar starter perhaps? ), a partnership which ceased when Dominion merged with Ehrenfried Brothers and incorporated operations at the Albert Brewery, Queen Street. Geddes was sole owner by 1892 – now the rich and successful man he had always dreamed of being. Like many of his ilk who were winners in the foodstuffs industry he wasn’t quite as bold as to step into politics and the like (he left that field to his wife); but he certainly played his part as a civic-minded individual – being the captain of the A Battery of the Auckland Artillery, prominent in the Masons, and president of the Auckland Bowling Club amongst other endeavours. Bay Of Plenty Times, November 1897. Courtesy of the National Library of New Zealand. He married Annabella Webster (b 1864, Mangungu, Hokianga, NZ,) in 1887 in Devonport. Geddes was already well-known as a wealthy merchant when he wed the quarter -Maori Mary, as she liked to be known – who was 21 years his junior. It should be noted that Mary had a fairly interesting family history herself, as daughter of noted pioneer and organ builder William Webster. Mary Geddes is often quoted as being half-caste, but in fact this is not true; it was her mother, Annabella or (Anne) Gillies. All from the Evening Post, January 1925, excepting the periwigged gentleman who was advertised in January 1927. Courtesy of the National Library of New Zealand. They had seven offspring: Mary Annabella (b 1887), Alexander (b 1890, later chairman of anthropology at Auckland Museum, a proponent of the Polynesian arts there), Jessie (b 1891), William (b 1893-1950, known as Bill, later Lt. and MC, and All Black for a split second), John (also known as Jack, 1895-1903), Robert (b 1898), and Hermann (b 1901, no doubt named in honour of Geddes’ late business partner, known as Mac, later Waitemata City Councilor). Alexander, William and Hermann are known to have entered the family business, William as managing director and Hermann as factory manager after WWII. Advert from the Self Help Cookbook, 1939. Before it was cut in half: “Looking west along Customs Street East from the corner of Commerce Street, showing the Excelsior Building.” Note Kempthorne Prosser signage. Courtesy of Sir George Grey Special Collections, Auckland Libraries, 1-W106. More on Hazelbank later, but for now, back to the main topic. Through the late C19th to the early twentieth century, Brown Barrett had several brands of tea such as UNXLD, Colombo Garden, Standard, and Excelsior (sometimes referred to as XLCR). but the most popular were Butterfly and Lion, lasting well into the 1920s and 30s (in an Auckland Star advert for Butterfly of October 1915, the company claimed the brand was over fifty years old which cannot be true given that it would pre-date formation of the company). Coffee was on offer under at least eight different labels over time from the 1870s on including Anchor, Golden Butterfly, Lion and Crown brands (Gregg’s also had an Anchor Brand, Lion Brand and Crown Brand coffee at the same time just to confuse the issue) – and the Brown Barrett brand was still being produced until at least the end of the 1940s in a can. A brand launched in the 1890s, UNXLD – which comprised of baking powder, self raising flour, egg powder, cornflour, coffee essence, pepper and spices, as well as coffee and tea. Coffee/Chicory essence or combinations thereof, were issued under the Excelsior and UNXLD brands with their self-named label also hanging on into the early 1950s. Poverty Bay Herald, December 1910. Courtesy of the National Library of New Zealand. However by the late 1920s they had pretty much dropped all the superfluous, frilly names which were likely created to give the impression of variety, and thus less of an appearance of monopoly in the marketplace. The self-named named Brown Barrett brand emerged as the lasting and triumphant, if predictable, one – and had a fairly broad range of products in its heyday of the mid 1920s to mid 1950s: Tomato sauce, peanut butter, Worcestershire, mustard, cocoa, coffee essence, cordial (orange and lemon, lemon barley water, grapefruit), coffee and chicory, “Browno” for gravy, fruit juice, curry powder, pepper, custard, baking powder, jelly crystals, “H.P”. sauce (it’s unclear whether they actually had a license from the British manufacturer Garton, at some point to make it domestically, or were just agents), and canned goods included tomato soup, sausages and beans, spaghetti, whitebait and coffee. John McKail Geddes, from the Cyclopedia of New Zealand, 1902. Courtesy of the NZ Electronic Text Centre. Like a few other companies over time such as Nelson Moates and Fuller-Fulton, they advertised often and plenty with a variety of highly illustrative, amusing adverts for their products some of which I have posted here further down. A general store, later extended in the early 20th Century to become Atkinson’s drapery, Avondale, Auckland 1880-1889, showing a Brown Barrett sign painted on the building side. Courtesy of Sir George Grey Special Collections, Auckland Libraries, 7-A9460. Geddes retired from the company in 1908, and died 1910 in Auckland of complications from Diabetes. A newspaper article of 1906 reports him being run over by a car but this does not seem to have had anything to do with his rapid decline. In a weird coincidence, his former partner Brown also had a transport-oriented accident the same year upon his visit to Auckland – where he gave a lengthy interview to the paper about his life in pioneer times and the founding of the company. Before he left, he ended up falling foul of a tram, ending up in critical condition with three broken ribs amongst other injuries . Various vintage pantry items. The Brown Barrett tin on left dates from the mid 1940s-early 1950s and appears in the 1948 ad at the top of the post, the one on right likely late 1930s and I recreated the label – three images down from the top of the post. The brand was sometimes separately advertised as “Blue Butterfly”. Auckland Star, October 1924. Courtesy of the National Library of New Zealand. Mary Geddes is well remembered in her own right (ironically far more so than her husband now) as an outspoken advocate for women’s rights and welfare – as well as an early champion of Maori culture – long before it was fashionable or even particularly acceptable, especially in the upper echelons of the “society” she was part of. She was, in fact, as a good friend of Sir Frederic Truby King, and became one of the founding committee members of Plunket, amongst other organizations. She played a significant role in the YWCA for many years and was president for six. “They were pretty predominant people in Auckland”, opines Andrew Geddes, “they paid for the frontage of the Saint Andrew’s church in Symonds street, including the tower.” However according to the history books, it was not until 1882 that the tower and portico were added, long before the couple even met. Perhaps they made some contribution to church hall or the new organ, during 1904-1907. However Mary was the proponent of the building of the William Gummer-designed YWCA headquarters in Queen Street. Quite a fearless and extraordinary lady, it seems. Auckland Star, June 1926. Courtesy of the National Library of New Zealand. While things were very comfortable with just over 100,000 pounds banked upon her spouse’s passing (that’s roughly eleven million bucks today, not including the various properties, and the profits that continued to roll in), she utilized her wealth to further these philanthropic concerns and was throwing open the grand family home and grounds for parties and fundraisers well into the early 1930s. “Oh yes, I spent some time at Hazelbank as a child. So we grew up with all those people, marvelous parties there. Christmas with a tree and real candles (on it)…. I think once they set fire to the tree and the fire brigade had to come and put it out!”, says John Geddes. Advert from the Self-Help Co-op recipes and household hints cookbook, 1932. The depression hit Brown, Barrett & Co hard and the business apparently “went under” according to one source. I haven’t found any evidence of this, and since they didn’t seem to close their doors – exactly how far under is a question. Certainly Hazelbank had to eventually be dispensed with and was acquired by the government in late 1939, along with the adjacent Sinclair Estate property – no doubt at a cut-rate price. It was immediately earmarked for demolition but this was not done until much later. A university map of the grounds dated 1959 shows the site marked “Sinclair Geddes” clear, bar one odd building to the south end which is clearly Hazelbank. Auckland Star, December 1898. Courtesy of the National Library of New Zealand. However demolition did eventually happen, and it’s a shame – since at the time, it was one of the older grand houses left in Central Auckland city – and significant as well, having belonged to Auckland colonial figures Judge Thomas Bannantyne Gillies (who served as Attorney-General amongst other posts, and apparently drew up the country’s first code of law) and later Colonel Wynyard (also quite a talented artist who did many sketches of early Auckland city, but oddly – not one of his own house that I have seen). An article mentions numerous military items of archaeological interest having been found on the grounds. Evening Post, January 1926. Courtesy of the National Library of New Zealand. Up until this time it was known as “Hazelwood“, but the McKail Geddes family sought to slightly rename it to truly claim it as their own and the “bank” obviously refers to the steep grade of the property down towards Grafton Gully. 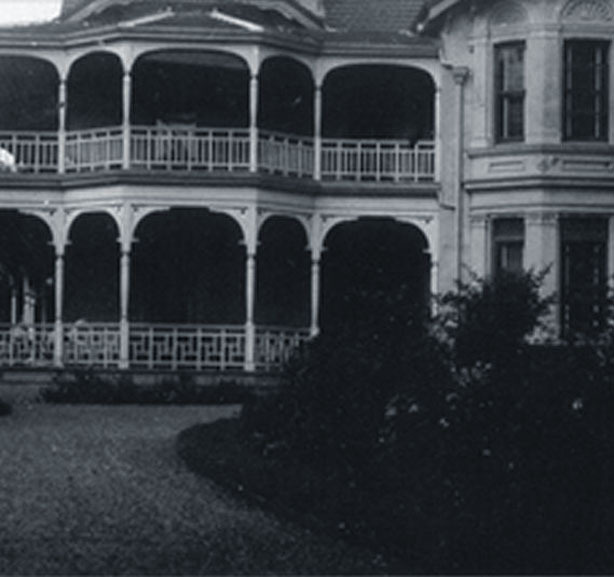 The mansion eventually became part of the Auckland University; and housed Elam School of Art, probably sometime after 1949 when the Grammar School Building burnt to the ground. Fundraiser for Young Women’s Christian Association at Hazelbank, Auckland Star, November 1927, with a demonstration of YWCA exercises. Courtesy of the National Library of New Zealand. These must have included some of the Hazel trees after which the property was originally named. John Geddes remembers as a child the big old Pohutakawa trees being quite impressive in size, even then. I suspect this part was facilitated by Hermann “Mac” McKail Geddes, since in a news article of the time he was 69 and he says he was born in Hazelbank. Hermann “Mac” McKail Geddes and his wife removed to Titirangi where they bought the heritage-listed “Rangiwai” house and gardens behind Lopdell House, the remainder of the 2000 acre Atkinson Estate. He became well-known as a proponent of flora protection and associated zoning issues, while his wife Ethelyn started up Titirangi Theatre in 1935. All round they were an active and interesting family. In this case he had a personal interest to retain some of the historic garden of the Sinclair Geddes block. Customs Street East: The Stanbeth Building in the middle, Excelsior building to the left, and part of the Masonic building to the right. © and courtesy of geoff-inOZ on flickr. An overlay of the 1959 map with current satellite imagery shows the new Elam building laid out exactly on the site of the mansion. I would say that the building was demolished between 1959 and 1963. I am not sure what the remaining land was used for but there were plans to build state housing flats there from the outset of the acquisition – which was still being discussed five years after the purchase, into the mid 1940s. This scheme never came to pass. Says John Geddes: “No, that never happened. They were very careless actually and they just shut the place up. They didn’t even use it for the war. The family always thought it was a bit of a failure that they didn’t keep it for something.” Unfortunately I was unable to find any images of the mansion at all, but surely a noted building with a series of remarkable occupants would have had to have been the subject of a photographer’s lens, and stashed somewhere? I had no luck. Masonic House, with Buckland House – the only building in the block not owned by Brown Barret & Co – distinguished by the last three rows and square street front windows on the Gore Street end. Courtesy of the Britomart website, © Cooper and Company 2012. All that said, somehow the actual “Brown Barrett” brand lasted well into the 1950s. There is mention of it, now with the name slightly adjusted to Brown Barrett Ltd, with premises at 79 Carlton (later Carlton Gore) Road, Newmarket – a building was auctioned in 1930 (possibly the Stanbeth, but maybe the Excelsior since soon after that was halved to widen the streets) and the company moved. It was likely here that the factory was victim of a serious blaze, one of the worst of the year it was said – in 1940. Andrew Geddes recalls “… a kauri four storey building. It was a great big wooden building right next door to Whittome & Stevenson’s. They were in total opposition to each other, both producing similar products.” That must have made for some interesting times. John Geddes remembers : “I was a kid at that stage and I would go and help pack the Butterfly tea, which before the days of plastics each box had a fancy little painted lead toy in it – soldiers, ducks sheep, cows. We would try to collect a set. Growing up at the factory was part of my childhood. It had a lovely view of the playground and the Olympic Pool nearby which my father had a hand in helping build.” In the 1940s, Butterfly was sold off to L.D. Nathan who were keen to have the total market. The last adverts I find for the brand are in 1938, presumably it was only purchased for its market share and then subsumed. Furness & Company signage seen from the Britomart car park, on the back of the Stanbeth building. They were the major lease-holder from the 1920s to the 1970s. Government records show that the company applied for a fish canner’s license for the Auckland branch in 1942, and then in 1943 for Picton, demonstrating that, the financial difficulties of the 1930s aside – the company had grown enough to open a South Island production set-up . John Geddes remembers his father “Mac” (Hermann “Mac” McKail) Geddes “got interested (in the possibility of tinning seafood) and he started running around in the war time (looking for opportunity) . He moved to Picton and set up a very efficient factory. I think it came about mostly because of their own initiative, but they had the advantage of being part of the scheme of providing food to the Brits on convoy. It was a bit of a picnic really.” He remembers “Dad was an expert on fish canning”, starting with pilchards out of Queen Charlotte and Pelorus Sounds, for the British market. Then after that they moved on to canning can eels in Christchurch in Lake Ellesmere. They were “big nine footers”, recalls John. “Those too were put into cans and sent off to London. That was a seasonal thing because the catching of eels was done with the great rise and fall of the lake and the immigration of eels to sea – when it rose to such a height it would break through the sandbanks and somehow the eels knew and would swarm out. That was the principal time when father was there catching them. He used to anticipate this by getting bulldozers and dredging channels before the big high tide so the salt water would come pouring through and all the eels, thinking the banks had been broken , would come charging up and they would come up these channels and be gaffed.” (a gaff is a large iron hook attached to a pole or handle and used to land large fish). Later, there was whale meat production which we will get to further on in the story. A lift crashed in the Stanbeth building, after the teeth on a cog wheel broke and a rope unwound, and falling forty feet with five passengers in it – including one of the daughters Mary Geddes. John Geddes says “…as she sailed to the bottom she had the presence of mind of counting the floors she passed!” Although most passengers broke their ankles, she got off with a sprain and went on to undertake significant social work throughout Australasia, like her mother. Auckland Star, 31 January 1929. Courtesy of the National Library of New Zealand. The canner’s license seems to have been filed for cancellation by 1953, and this is that last official mention of a date I can find directly associated with the company. By 1946 Brown Barrett (Picton) Limited also obtained a license for tinning fruit and vegetables. Throughout they were constantly advertising situations vacant (one requiring “splendid girls”, another “intelligent men, no experience essential”) – for food packers, manufacturing assistants, washers, labelers, bottlers and other staff. It goes unsaid – war time meant short labour and they did have a contract to supply tomato-based products and whale meat for the troops, whilst continuing to make “non-essentials”, right up until the end of the war. My favourite ad insisted that the prospective employees “apply in their own handwriting.” I don’t know whose else they would use. Anabella Mary Geddes (centre back) and John McKail Geddes (right) and their family, 1890s. The man to the left is likely Mary’s father William Webster. Private collection, courtesy of the Te Ara website. Of course the most famous building now associated with Brown, Barrett & Co is “The Excelsior”. It opened around 1897 at 22-24 Customs Street East, Britomart. It was actually one of four warehouse buildings that the company requisitioned or built on in the vicinity and it was never actually used by Brown Barrett for the business – they had another premises at 30-32 Customs Street East, two doors down from The Excelsior, “The Masonic” – where they operated the coffee roasting house. (Previous to this they had roast or mill premises around the corner in Wyndham Street, and before that a very well-established set-up in Elliott Street near the entrance of Darby, from 1876 to the early 1890s; High Street previously mentioned was the very first, before that). Instead, The Excelsior was the long term home of many other businesses. The first to hold a lease were Kempthorne, Prosser & Co (drugs and medicines, beauty and health products, manures and fertilizers, cleaners, culinary essences). Later, J. Wiseman & Sons saddlery, and Arthur Cleave & Co, printers. In the 1940s it was a Bank of New Zealand. The western portion was removed in the 1930s to widen Commerce Street so it is today half its size, which sounds rather forlorn – but only looks narrow. A map of the Auckland University grounds of 1959, showing Hazelbank marked in red on the Sinclair Geddes block. At this time it was being used as Elam School of Art. Published in “UOA Main Campus Development”, 1987. Courtesy of the Fine Arts Library, The University of Auckland Library. The Masonic was acquired in the late 1880s and remained in the Geddes family until 1945. Today Buckland’s Building at number 34 is almost indistinguishable from The Masonic, appearing as one large building – however the last three vertical rows of windows and the square street front windows define it on the Gore Street end. Next door , between The Excelsior and The Masonic, is Stanbeth House at numbers 26- 28. The front half of this four-storey building, on Customs Street East, was built in 1885 as a warehouse for Coupland & Company. The rear half, facing Galway Street, was added by McKail Geddes in 1908. A number of Kauri gum merchants in the early 1900s, the Old Age Pensions Office, the New Women’s Club, in the forties the Auckland Wool Stores and British General Electric, and also some eateries – grill rooms and cafés – were some of the occupants over the decades. Today the backs of the buildings are fairly unremarkable, facing on to the car park area. However, I did spot a painted sign that remained up on the wall in a corner – “C. H. Furness & Company” . They were the major leaseholder from the 1920s to the 1970s in the Stanbeth building. Who knows how old it is, but it’s nice it has been left – maybe not deliberately. A variety of Excelsior Coffee and Butterfly Tea ads from between 1905-1921. Courtesy of the National Library of New Zealand. The Excelsior, Stanbeth, and Masonic were recently refurbished with attention to heritage detail, as part of the recent rejuvenation on the Britomart precinct. Post-war, a number of events happened one after the other that knocked the company down and every time it became a little more difficult to stand back up. From the mid to late 1940s, the end came for many Government ration contracts that had been set up with many businesses to supply the troops. They were extremely busy, stressful and distracting times, with a lack of manpower to boot. But with all that going on, some like Wattie’s didn’t take their rise in fortunes for granted: they saw this obvious change as inevitable in coming and made moves to get around the sudden massive dip in profits by looking to development of other products . For others succession planning to cope was not so successful. Observer, 2 December 1907. Courtesy of the National Library of New Zealand. Brown Barrett Advertisement 1930-1935. Kenneth Magill collection, Alexander Turnbull Library, Wellington, New Zealand. Ref: C-105-015. Meanwhile in the South Island, after Brown Barrett Ltd moved on from Lake Ellesmere, they got into a very successful business of canning whale meat – “tasty and nourishing, cooked ready to serve with salt added, immerse in boiling water for 15 minutes to serve hot, ideal for pies and stews” read the can labels. “Thousands of tins were sent away to famine-stricken Europe”, says John. One contract alone was for the equivalent 304 tons. The Perano Brothers’ business was established in 1911, and Joseph and Gilbert Perano carried it on until 1964 when whaling was brought to an end. However while it lasted it was a very lucrative partnership indeed. “They cut the meat up into three ton steaks, carted them into Picton to the factory and then as they did with the pilchards , they would salt it in barrels to store it. Eventually it went to Britain canned”, recalls John Geddes. Things were going well, apparently until the Agricultural Department intervened and according to John “this is where the problem came in – the content of a shipment went bad because it hadn’t been properly cooked, which it would have been if they had been allowed to stay with fisheries department. But they were directed to do what was required by the agricultural department instead. It went off as the ship was coming in to Southampton so that meant that the whole consignment had to be tossed. It was government bureaucracy” that caused the problems. On top of that, In the early 1950s William (Bill) McKail Geddes fell ill. “My uncle Bill had cancer of the brain and died” – remembers John Geddes, “So dad had to come back to Auckland to run the Newmarket operation, there was nobody else”. John Geddes remembers helping pack the free painted lead toys in with the boxes of tea at the Carlton Gore Road factory, as a youngster. This advert from the Auckland Star, February 1938. Courtesy of the National Library of New Zealand. At that moment new policies had just been introduced that restricted ready overdrafts that many companies like Brown, Barrett Ltd regularly needed access to in order to be able to acquire bulk raw ingredients , at crucial times, for later production. Says John Geddes: “The firm survived by virtue of getting overdrafts – particularly for tomatoes – which they used to buy in vast amounts in the prime season when they couldn’t process them for the market – and they would be condensed and put it in kerosene-style four gallon tins. They were used whenever Brown Barrett wanted to manufacture soup, baked beans or spaghetti; they would crack open the big cans. In those days it was a matter of sorting out a exactly what was needed and what would be purchased (in advance, taking into consideration what was wanted) by Four Square and other customers. The marketplace was highly competitive – if Wattie’s dropped the price on something they’d be stuck with all the stuff so they were pretty critical about everything that they did. It was highly sensitive but it worked. I think it was just a case of the monetary policies, it was just coincidental bad luck that the bank said at the time “you can go somewhere else and find it”. So you’re quite right to question – “it was an old company – how could it collapse?” Well , for a number of reasons. They did extremely well up until the crisis of the whale and then the pork. Looking at the old balance sheet it was just awful, but you know, they had managed to survive (until then). Then the family put my father out of commission because he was getting a bit distraught in sole charge. In one incident he went to see the manager and threw a live cartridge on to the table and said “that’s what you’re doing to us!” and that was enough for the rest of the family to say “let’s put this company into liquidation because there’s not going to be much future.” They really railroaded my father – and it was the best thing that could have happened to him because he lived for another 20 years and went on to have a successful career in council”. UNXLD was a brand Brown Barrett & Co launched in the 1890s. Poverty Bay Herald, February 1911. Courtesy of the National Library of New Zealand. Taking the entire company history into consideration, the end is a movie-worthy saga in its own right. Around the time Mary McKail Geddes passed away, the business was dismantled. “The ownership was spread all over the family, but grandmother was the major shareholder. The business finished in 1955 and that’s because the company was no longer going to be sustainable. It wasn’t forced by debt or anything like that”, says John. I did find reference to the Excelsior Buildings and Investments Limited company offices being “gutted” in 1959. Whether it was still even in the family by then – I don’t know, but it would have been the last one in the block left. So as it turns out – it was the result of a number of different events that compounded and thus resulted in the closure of one of New Zealand’s longest-running and most successful foodstuffs businesses. In the end it was a difficult and sad, but entirely voluntary decision of the family to close the doors for good. The Excelsior Building 1940-1949, after half has been removed to make way for the widening of Commerce Street in the 1930s. BNZ are in occupation, and Stanbeth House next to it has British General Electric and Auckland Wool Stores residing. I just had a flashback to sitting in the pokey little cafe at the front of the bus station, bottom left, drinking tea and smoking ciggies whilst waiting for the school bus on cold winter mornings. All gone now, of course. Courtesy of Sir George Grey Special Collections, Auckland Libraries, 580-400. Special thanks to Victoria Passau at the Fine Arts Library, The University of Auckland Library , Lisa Truttman at Timespanner, and also Joanne Graves, at Central Auckland Library Research Centre, for research assistance on the University grounds and Hazelbank estate. Also thanks to Bevis England at Fringe Media, and members of the McKail Geddes family – Andrew and Janet Geddes, John and Claire McKail Geddes. Addendum Feb 2013: Finally! A part image of the Hazelbank house. Courtesy of descendants of John McKail and Mary Geddes, who dug this up for me eventually from an old family album. Although somewhat cropped, you can *sort of * get an idea of what it looked like, with the house seemingly facing north-east, with the front facing away from Symonds Street looking down to the gully, according to the 1959 map. Or fronting more towards the (now missing part of) Wynyard street, which would make more sense. That is presuming that the building shown in the grounds drawing is Hazelbank, it’s unlikely it had been replaced just yet.